Sabotage. 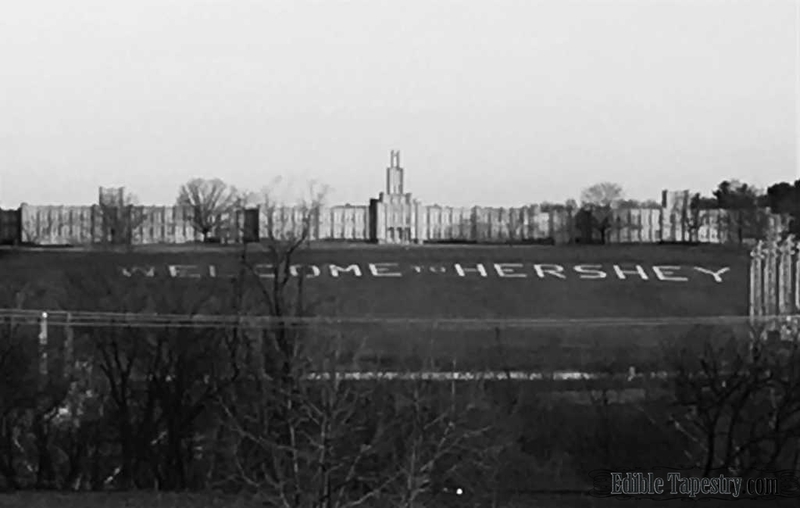 I was doing very well in my low carb lifestyle, with a slice of pizza and a glass of soda allotted for the following day, when, while traveling through Pennsylvania one evening, my husband decided he needed to refill our truck’s gas tank, and he to needed to do at the next exit, which happened to be the Chocolate Town (Hershey, PA) exit. I was nervous when, following his fill-up, he headed right into town to have a look around. 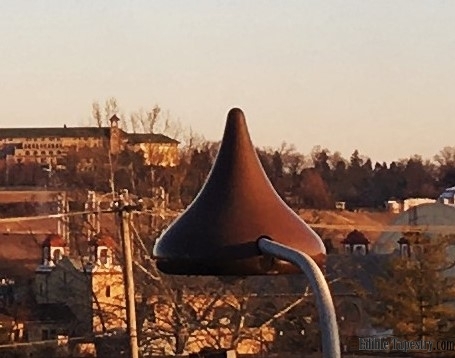 The next thing I knew, we were getting a hotel room with a view of the old corporate offices and a chocolate kiss street lamp hanging over the road. I knew then that I would be adding chocolate, and probably a lot, to my already overloaded carb plan for the next day. Sigh. 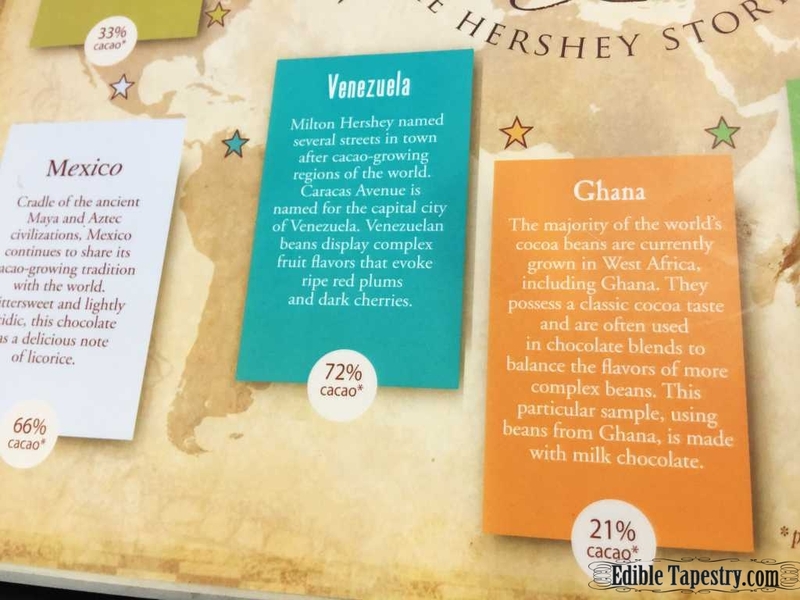 I tried to suppress a naughty giggle but…Hershey, Pennsylvania!!! 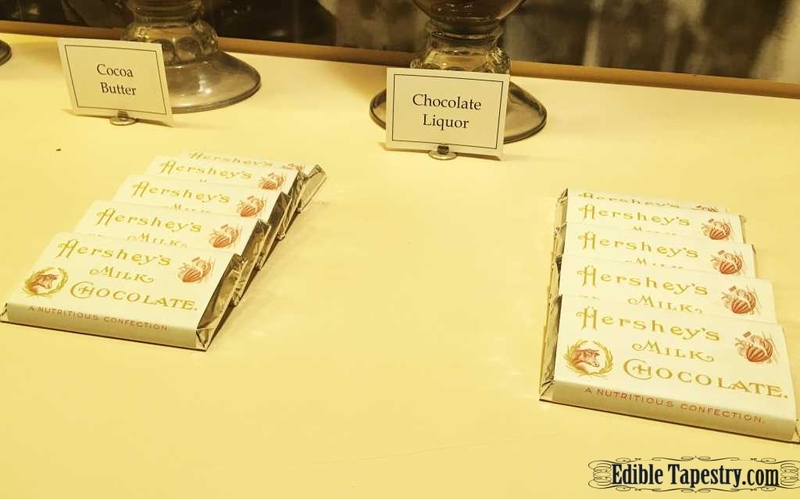 Everything was closed by that point, but we figured, after doing a quick online check of the hours of all of the attractions in Hershey, that we would have time to squeeze in the museum tour, with a little chocolate tasting, the next morning, if we were back on the road by 11 a.m. I love how spontaneous my husband is. I grew up with parents who loved to surprise us kids with impromptu or secret trips. I’ll never forget the time they showed up at school in the middle of the day in one of those monster Winnebagos to check us out early so we could go camping about an hour up the road. My sister and I flipped out, thinking they had bought it, but were just as excited when they told us they had only borrowed it from friends for the weekend. Another time, on a trip to visit a former college friend of my dad’s, they kept us distracted by looking for “alligators” on the road. The “alligators” were the shredded semi truck tires that end up all over the highways in Florida. But my sister and I soon recognized the old wooden signs that line the entrance to Disney World before you get to the gate. We didn’t know if we dared hope but asked, “Are we going to Disney World? !” We were. On other trips, Dad would load up our van and we would all pile in with no particular destination in mind. Those were my favorite times. So, naturally, it was important to me, and my husband who very quickly grew to love this family tradition of mine, to raise our kids the same way. The only problem is, our younger son has started trying to put his foot down and now “requires” notice a day in advance of plans we have. But we never know if we will end up doing anything on the weekends or just chilling at home. The best compromise we can come up with to help him out is for me to tell him on Thursdays, “Just so you know, we might be hopping in the truck and heading out somewhere on Saturday or Sunday.” Ha ha. Poor kid. We rolled with his sensitive nature during his developmental years, but then started making sure he was able to deal with being “a little uncomfortable” some of the time, too, even though, with all of his father’s health issues and scares, he’s already had more of that than any kid needs. But to keep that spirit of spontaneity, we still allow ourselves last minute outings, asking the boys first thing on a Saturday morning if they’d like to go with us or hang out at the house, now that they are both almost grown. Or, if it’s a day trip idea out of town that we want them along for, I send my husband to their rooms to break the news to each of them and get them up and in the truck, because our “little guy” grumbles less at his father than his mother, as I’ve always had the honor of being the “bad guy” as the homeschool teacher, scheduler, chore list enforcer, vegetable eating monitor, etc. But whether he grumbles or not, has had advance notice or not, those last minute plans always end with smiles and him saying he had a great time. And my heart swells every single time. 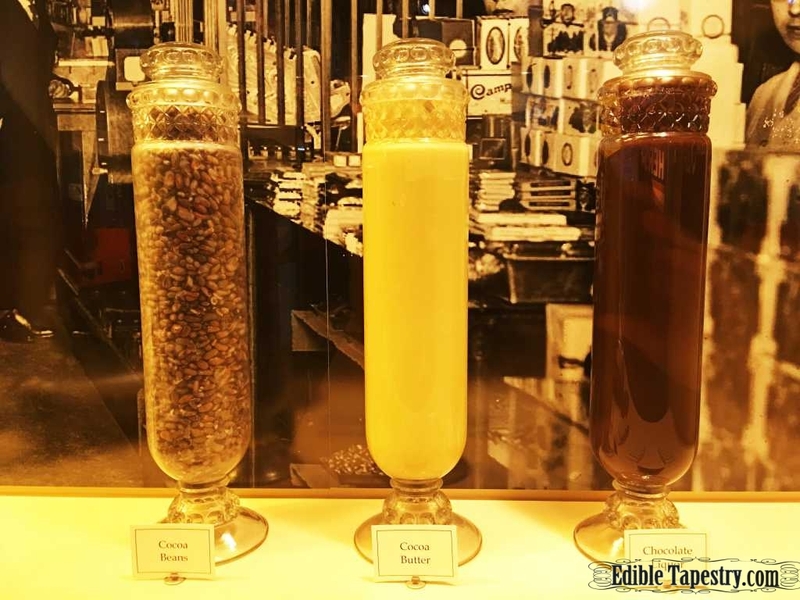 So on our impromptu Chocolate Town trip, I took one for the team (naughty giggle) the next morning and headed down to breakfast with my little family to carb it up. 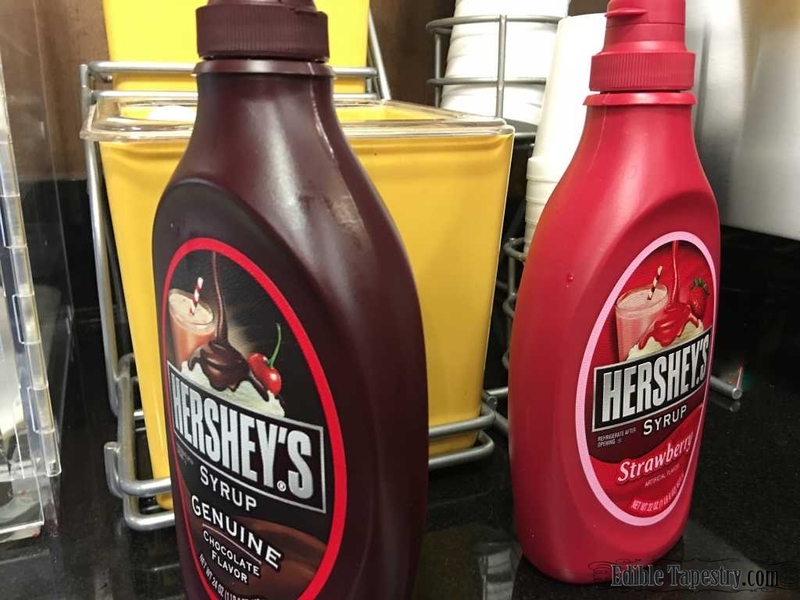 Of course they even had Hershey’s Syrup at the breakfast buffet. My stomach recoiled when I saw that and all the other sickly sweet things on the buffet, the likes of which I had been avoiding for quite a while, but within an hour we were in the museum across the street and that old craving kicked into high gear, getting my mouth watering for the chocolate we intended to sample at the end of our self-guided tour. 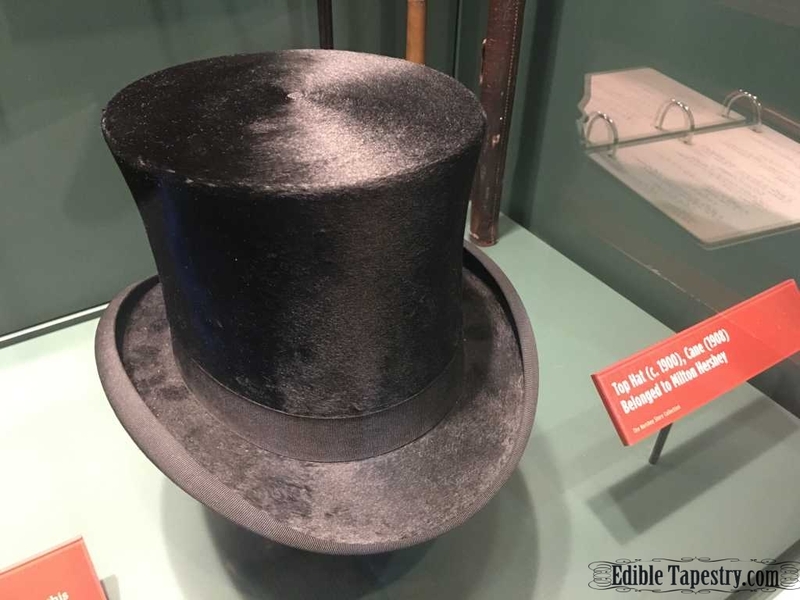 The Hershey Story museum takes you from Milton Hershey’s childhood to how he started in chocolate production. 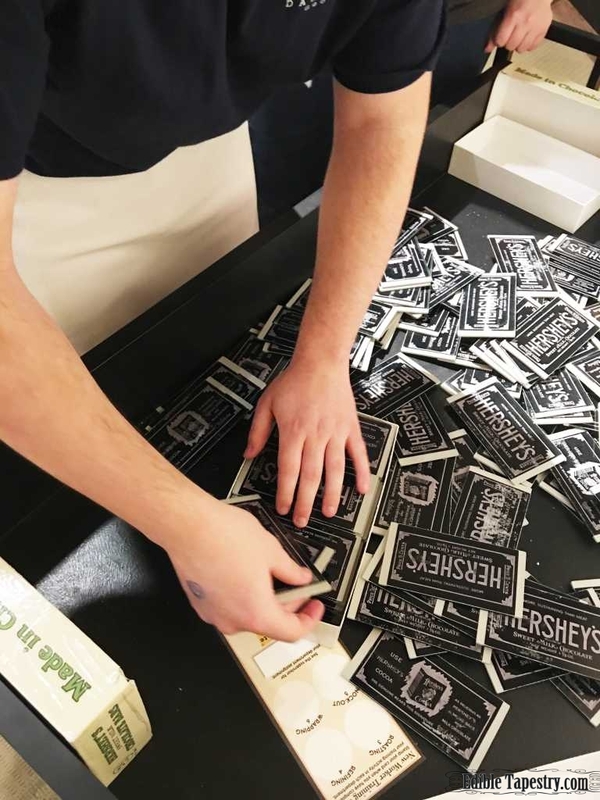 Then it guides guests past a timeline of world events that coincided with the Hershey Company’s growth, such as the sinking of the Titanic which Mr. Hershey narrowly escaped when he didn’t board with the VIP maiden voyage ticket he had purchased, and on to other endeavors of Mr. Hershey and the company. 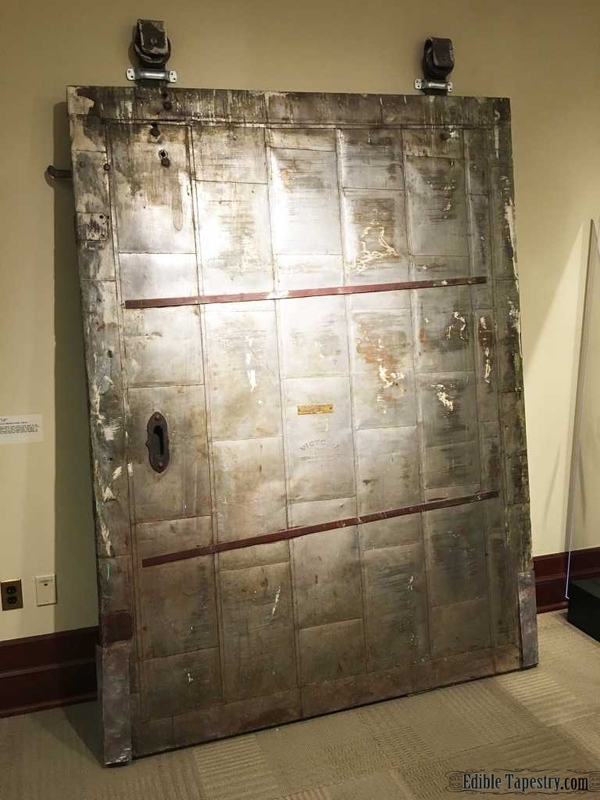 The timeline was enormous, covering several walls, and so much fun to read! 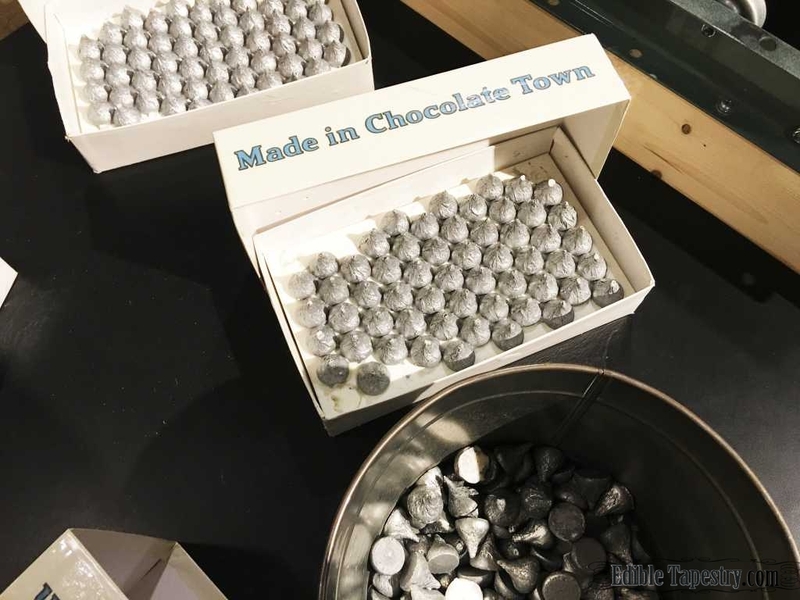 At the end of the tour, there is a chocolate tasting bar and a hands-on interactive “distribution center” for visitors to “work” in traditional factory waist aprons, to get an idea of what employees at Hershey experienced. 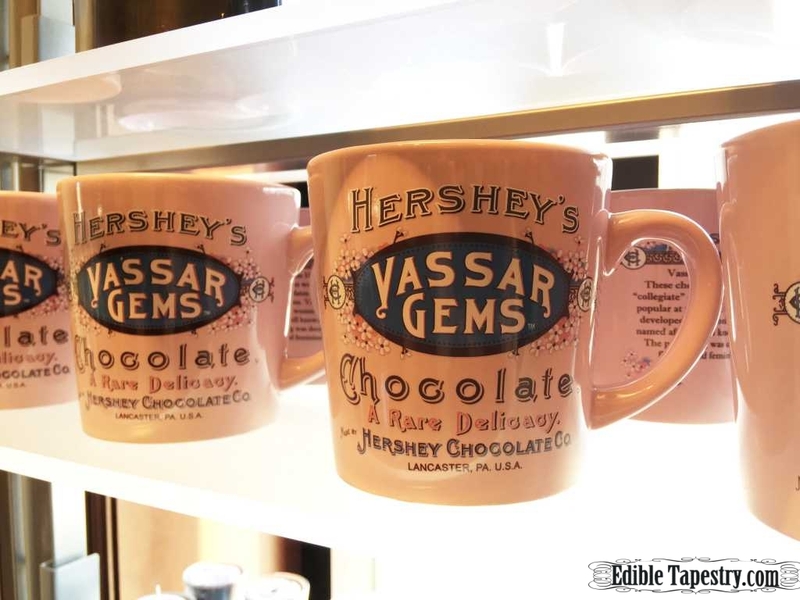 And of course, there is a gift shop loaded with chocolate and chocolate related products such as aprons, mugs, and even jewelry, as well as a cafe so guests can do even more sampling of Hershey chocolate products. 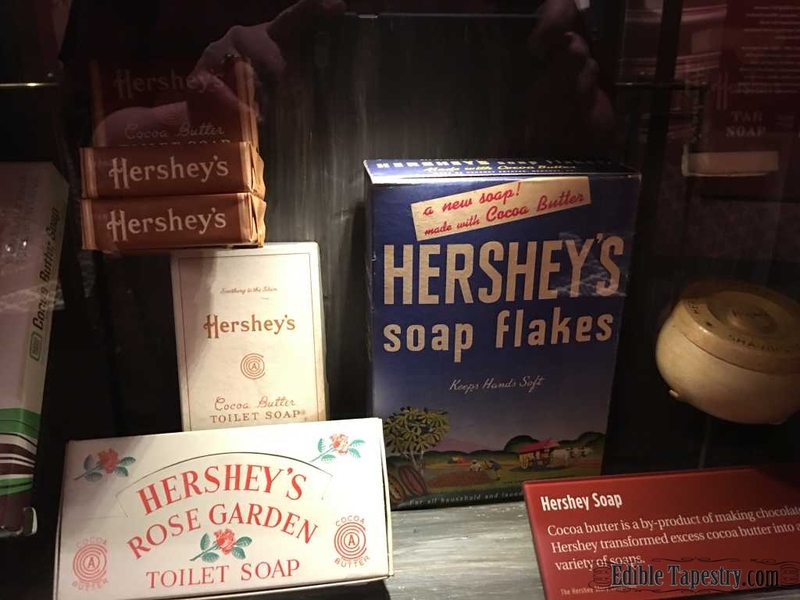 I learned a lot I didn’t know about the Hershey company that day. 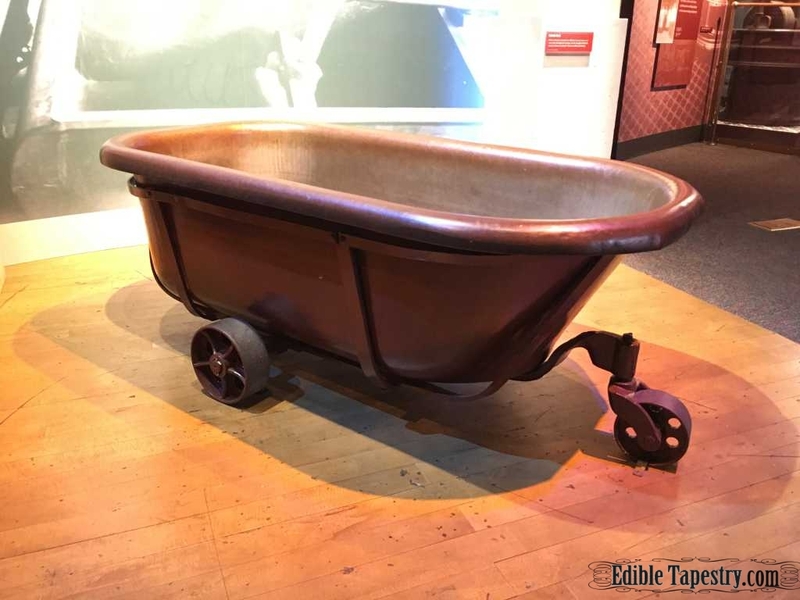 Two of my favorite things were that they used copper bathtubs, retrofitted with wheels, for hauling ingredients around the factory. 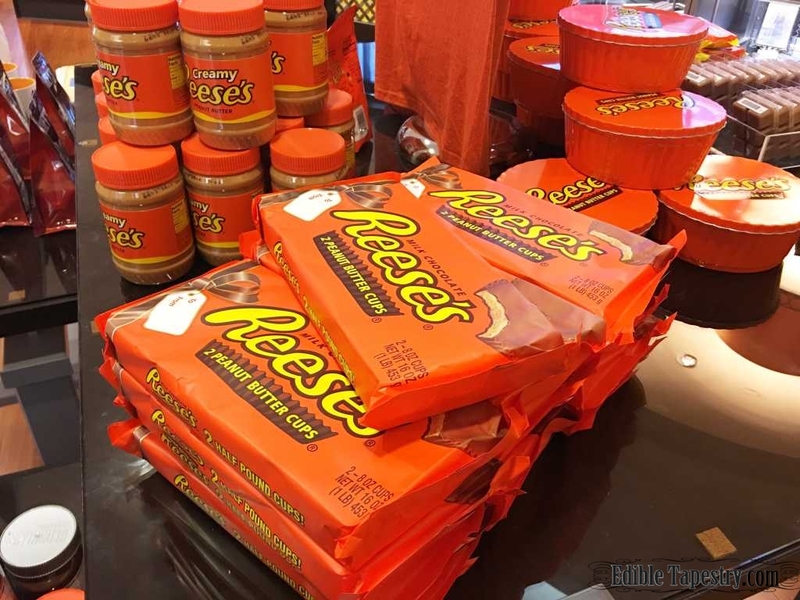 That just seemed so Willy Wonka to me, “No other factory in the world mixes their chocolate by bathtub.”, I could imagine Milton Hershey saying to his investors. 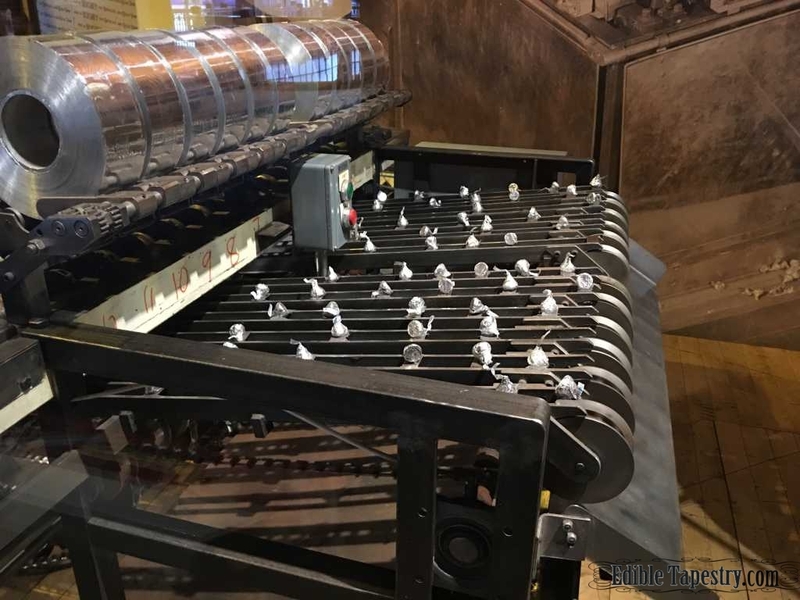 I was also surprised to learn on our tour that the first artificial heart, the one I heard so much about while growing up in the ’80s, was invented at the Penn State Milton S. Hershey Medical Center. 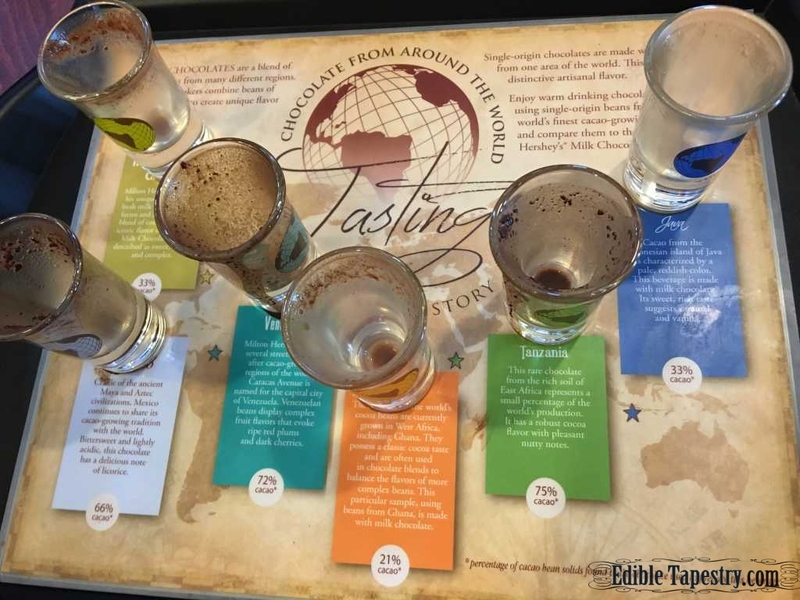 After being surrounded for a good hour by everything chocolate, we were more than ready to take our flight of “Chocolates from around the World”, with the chocolate tasting bar’s warm drinking chocolates, which were more melted chocolate than the hot chocolate beverages I had imagined. 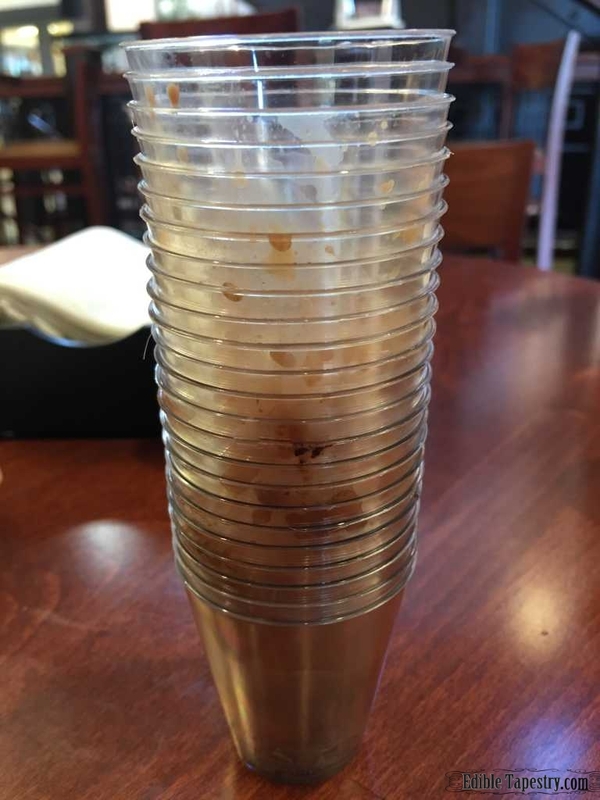 When this was explained to us by our server, we very quickly decided to share one flight, rather than each of us sampling a full set of six small glasses, which were about the size of a double shot. Boy were we glad we split a flight! That was a lot of chocolate, even divided four ways by a family of chocoholics. 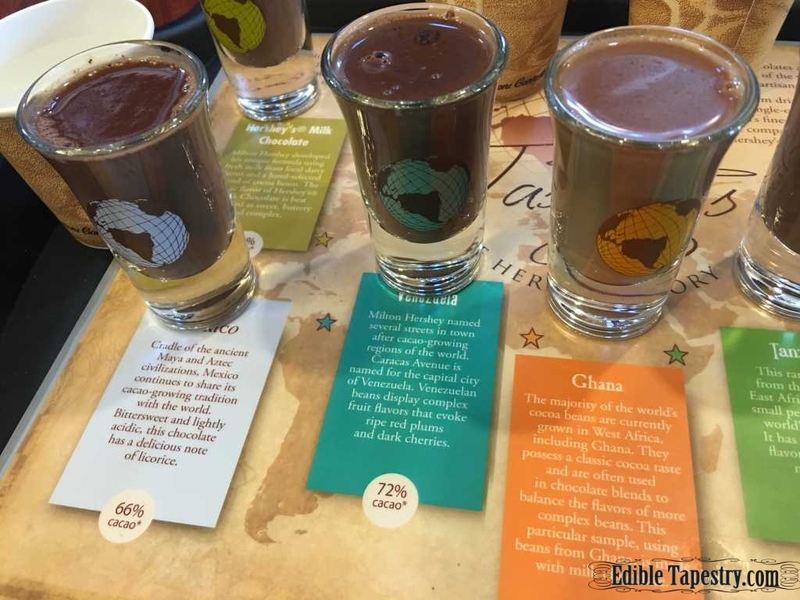 In the end, we unanimously decided that “Java”, a rich, creamy 33% cacao blend, was the most fun to sip in liquid form. 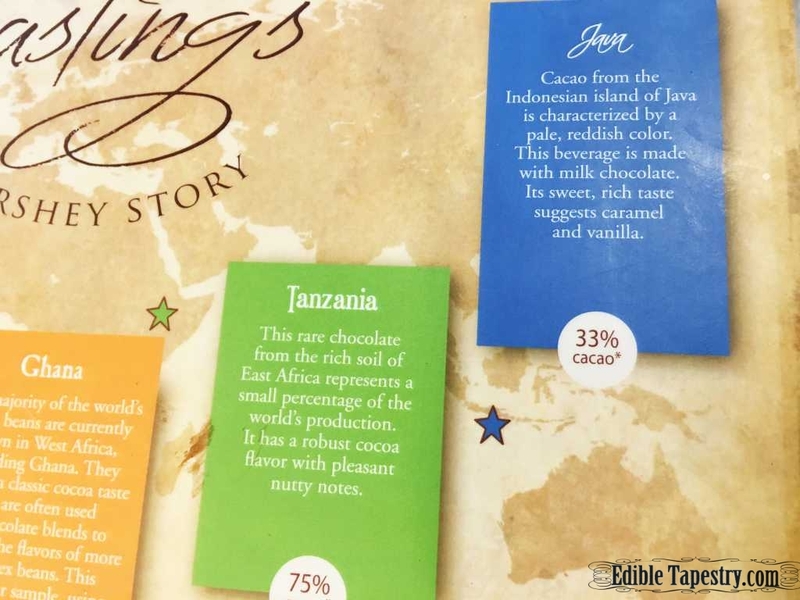 But we also really liked “Tanzania’s” silky, dark richness. 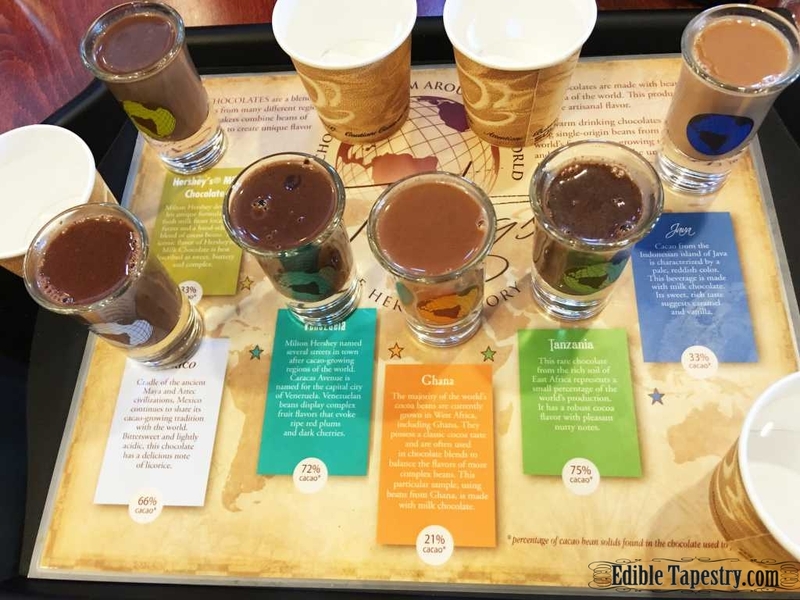 The only downside we could find with our tasting experience, and what seems like a missed opportunity for Hershey, is that you can’t buy samples of the chocolates you tasted to take with you, like you can when you go wine tasting or sample a flight of beer at a brewery. I just found that a little disappointing. 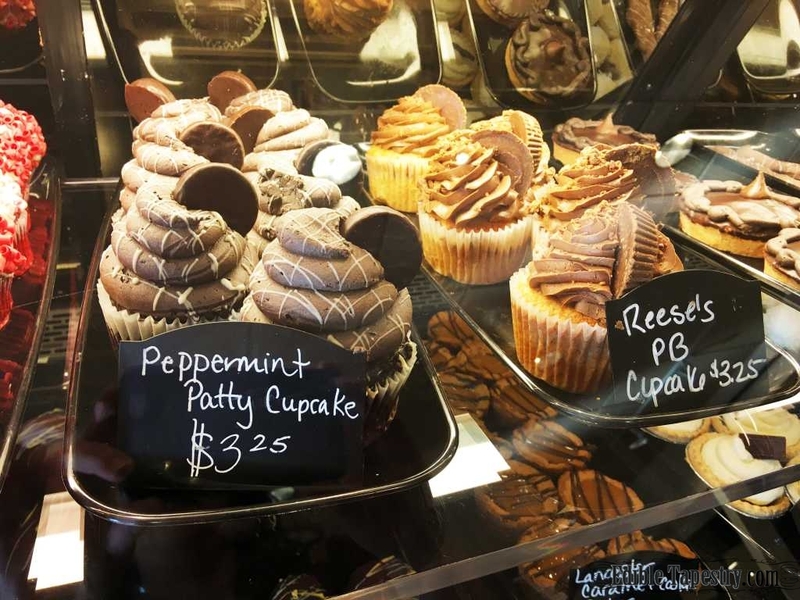 Because we had plans to stop in New York for pizza later in the day, we took pastries from the Hershey cafe to extend our chocolate tasting to finish that meal. 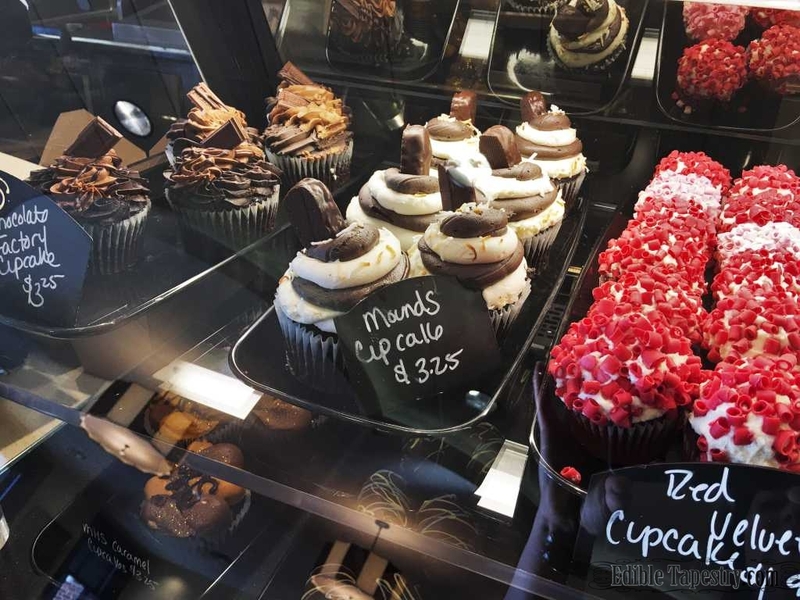 Two of us couldn’t resist trying the Chocolate Factory Cupcake, another, the Peppermint Patty Cupcake, with an entire peppermint patty stuck in the fluffy chocolate frosting, while a strip of chocolate covered bacon had my husband’s mouth watering. 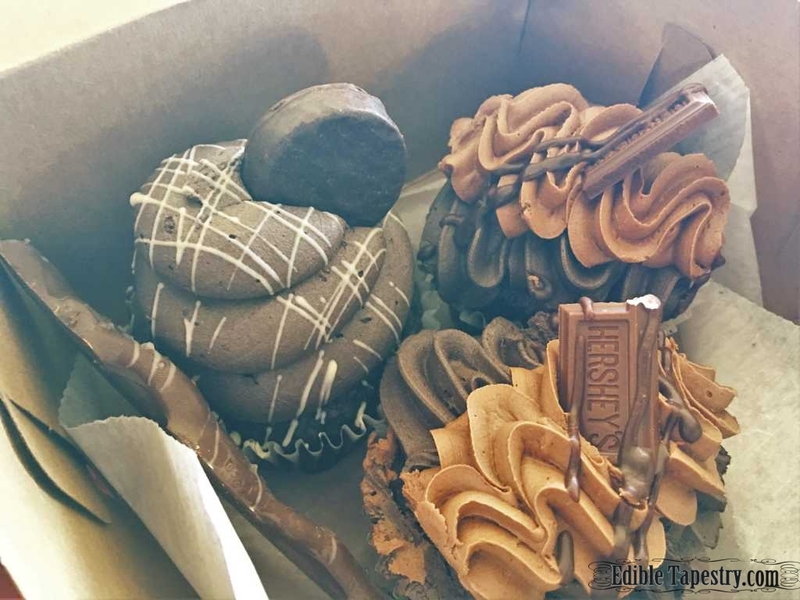 So off we went, on to other adventures, with a bakery box full of Hershey’s for the road and more sweet memories made for our family.